Norra Wexley: Recently reunited Mother of Snap Wexley and pilot to the New Republic. Her actions on Akiva ruined Sloane’s secret meeting. Leader of the Imperial Hunters. Temmin “Snap” Wexley: Enthusiastic pilot working his way up to flying New Republic X-Wings. If only he can keep himself from being distracted. Getaway driver to the Imperial Hunters. Mister Bones: Modified B1 battle droid and protector to Snap Wexley. The quips and cackles create massive damage, as Mister Bones has been upgraded again to maximum performance. Sinjir Rath Velus: Former Imperial Loyalty Officer that is currently involved with Imperial Hunting. Life is still a struggle as he works to acclimate to a more civilian lifestyle. Old habits die hard. Conder Kyl: Ruggedly handsome slicer to the New Republic. When not embarrassing Sinjir, with PDA, he lives a quiet lifestyle. Jas Emari: Zabrak bounty hunter working, with Norra to hunt Imperials. However, time is not on her side as her debts weigh over her. Wedge Antilles: After injuring his leg during the events on Akiva, Wedge and his trusty cane train the future New Republic pilots. In his spare time he enjoys picking just the right bouquet of flowers. Han Solo: Sporting a scrappy beard, this scoundrel dove head first into a liberation mission of Kashyyyk. He was a General at the Battle of Endor and recently got married! Sorry ladies! Chewbacca: Co-pilot to Han Solo. Everyone wants to give this Wookiee a hug. Han would be lost without his number one pal. Grand Admiral Ackbar: This Mon Calamari New Republic Grand Admiral is on fire! Victory after victory, for the New Republic. Though, there are some battles that give him cold feet. Yupe Tashu: Former Advisor to Emperor Palpatine, who does little more than getting tired running his mouth about crazy dark side shenanigans. Leia Organa: The last Princess of the destroyed planet Alderaan. This former Senator to the Galactic Empire, leader of the Rebellion, and current face of the New Republic continues to soldier on against injustice. Evaan Verlaine: The surviving Y-Wing pilot from the Battle of Yavin, this New Republic pilot has close ties with the Alderaan royalty. Chancellor Mon Mothma: An aspiring historian in her youth, she grew into the family career path of politics. Currently, she is the Chancellor to the New Republic, and though diplomacy she will unite the galaxy. Grand Admiral Rae Sloane: The honorable face and voice of the Empire. Sloane will challenge all, who oppose her. Only it has been rough keeping the Galactic Empire at peace, with growing treason. Mercuriel Swift: Up and coming bounty hunter, who became a known name in the New Republic era. Has a leaning to taking on Imperial jobs, but is a neutral party. Gallius Rax: Orchestrator of massive deception. There is much to learn of this former Fleet Admiral as he plucks and pulls the strings of the Empire, with the unverified blessing of the Emperor. I said it before and I will say it again. Chuck Wendig is the Bob Ross of Star Wars! His writing style of third person present tense allows the reader to get inside the mind of the characters in a way that feels in the moment. Each line a stroke of his paint brush, and occasionally, he “beats the devil out” of the brush (story) in a pivot moment. How Wendig is able build up our expectations of a scene in one direction, and then completely flip it on it’s head. Not to mention the variety of his canvas is really colorful. I have grown fond of his way of painting my imagination into a fun experience. The audiobook version is the ultimate way to experience the story. I thoroughly enjoyed the first novel audiobook, and was floored by Life Debt audiobook! There were so many times I just got lost in the story, because Penguin Random House and Marc Thompson did a phenomenal job! In the first novel we were introduced to the main cast of the Aftermath trilogy, and at the time the movie The Force Awakens had yet to release. Because of that, the first novel only hinted at things to come. In Life Debt, the gloves came off! Not only was Wendig allowed to pull from The Force Awakens, but all the new canon stories released so far as well. The ones that made a big impact were Princess Leia comic, and the Bloodline novel. The story of Aftermath really opened up, when Wendig was allowed to write about big name characters from the movies. For example, Wendig finally could blend in Han Solo, Leia Organa, Chewbacca, and more, with the new characters created in Aftermath. Even new characters from The Force Awakens got a chance to cameo in Life Debt. 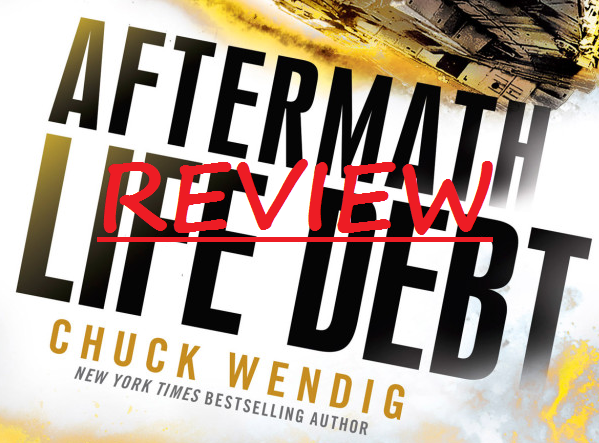 What worked beautiful, with Life Debt was how Wendig peeled back the story of self discovery of the characters. The main cast was brought together at the end of Aftermath, but where did their destiny truly lie? How the tides turned as the Force brought them together through events was a fun ride. On top of all that there were some game changing reveals in the novel that go as far back as the prequel era that affect the sequel era! So many questions crop up in Life Debt that could change the course of history in the New Republic. The state of the Empire and the New Republic took an interesting turn in Life Debt. I am really digging how Wendig was able to flesh out the time between Battle of Endor to the Battle of Jakku. How there are heroes on both sides. How both sides attempted to build up the pieces, and find peace. How each side had conflicting methods of leadership and control. Both sides walking on eggshells. First is again Sinjir Rath Velus. I could connect, with his type of humor that left me cackling maniacally. The journey of self discovery worked really well, with Sinjir, and I hope he makes it passed the Aftermath trilogy! I can only imagine the things he will say or do in Empire’s End. He does drink a lot though. (Spoilers: I rarely ever drink alcohol.) But even that doesn't detract from my liking of his character. Second is also Rae Sloane. Just because she is a bad woman, doesn't make her a bad woman (Zangief from Wreck-It Ralph said it better). Anyways, Rae Sloane’s character arc was such a delight that only made me root, for her cause. If anything happens to her in Empire’s End I will be a sad panda! Her underdog story in the Empire left me feeling her frustrations as she sought the honorable path. Third is Leia Organa! Full disclosure here. Growing up I was not as knowledgeable about the main cast of the original trilogy. I knew Han, Luke, Leia, and Chewbacca were special; however, I did not dive into the expanded universe (know known as Legends stories) until much later. How things have changed! Knowing more about her character, and the new stories that have come out in the last couple of years gave me a greater appreciation to Leia. These stories include Bloodline by Claudia Gray, Moving Target by Jason Fry and Cecil Castellucci, A New Hope: The Princess, the Scoundrel, and the Farm Boy by Alexandra Bracken, her appearance in Star Wars Rebels, and all the comics she has appeared in! Most notable of the comics were Princess Leia mini-series, Vader Down crossover event, and Shattered Empire. However, there was something truly magical about the Leia we got in Life Debt that I couldn't quite place my finger on until I read Amanda Cherry’s article over at Tosche Station Podcast titled, “The Princess, The General, and the Story Group: in praise of old favorites in the new canon” (found here). In the article it highlights how well the new stories have consistently built up Leia from the Princess we knew in the original trilogy to the General we meet in The Force Awakens! To get the most out of Life Debt go in fresh after reading the first Aftermath novel and other stories from the first year of the New Republic (more info here)! There were so many small plot threads introduced in the first novel that either take center stage or continue on in Life Debt’s interludes. Also, read the 5 issue comic Princess Leia written by Mark Waid, penciled by Terry Dodson, inked by Rachel Dodson, and colored by Jordie Bellaire. Lastly, it is highly recommended to read the Servants of the Empire junior novel series by Jason Fry. In the fourth book we are introduced to character that appears in Life Debt. Change is inevitable, but it does not always go in the direction you expect. Where the main cast of Aftermath started completely shifted by the end of Life Debt. I thoroughly recommend this story, and excited to explore the final novel! I can understand that this story may not be for everyone, but it is one heck of a ride. Just let it in.